The warmer weather today has me wanting to get back on the bike and ride. It also reminded me of this video I found on YouTube the other day. Happy New Year & 2018 Blogging Challenge! I hope everyone had a great holiday season and started 2018 off in a positive way. Things have been busy around IndyScan HQ and the Blog has suffered a bit by lack of activity. This post is sort of a catch up post summarizing some of the events in 2017 and, hopefully, setting the stage for 2018 entries. I’m going to challenge myself to post a minimum of 1 entry a week detailing the things going on around me and the new things I’m discovering and/or enjoying. I’m going to harness the power of ToDoist to keep me from slipping. It’s one of my favorite task managers and when combined with Evernote helps keep my life organized and commitments met. I had a lot of fun posting images on Instagram this year and viewed some amazing photography. Most of it was from cell phones that have evolved to a point where they could replace the SLR for all but the serious photographers. I still love my SLR but you just can’t beat the convenience of a good cell phone camera. I really enjoyed the new road bike I purchased in early 2017. It took me a while to get back into the groove and I still have a way to go to get back to the distances I used to ride when I was younger. I have a few trips planned for 2018 that should prove to be challenging as well as rewarding. 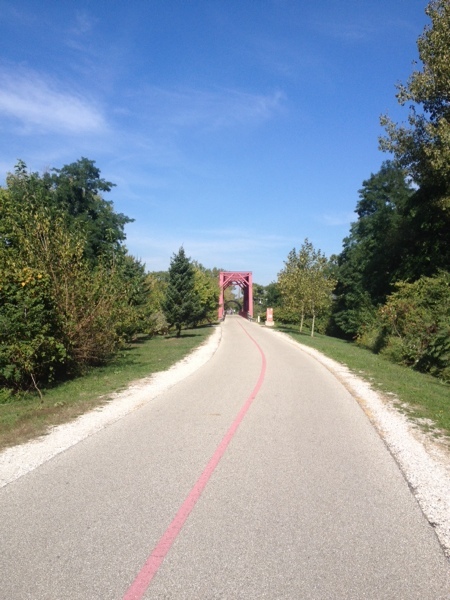 One of my favorite rides of 2017 was the Monon Trail from Westfield to Indy and back. It was a little longer of a ride than I was expecting but it was a great accomplishment that sets a base for my 2018 riding goals. We’re trying our hand at making wine this year too. We purchased a kit at Great Fermentations as a joint Christmas gift and have been brewing up 6-gallons of Pinot Grigio (30-bottles) the past month. Hoping to start the bottling process by the end of January and, after a little more aging, start sampling in April or May. 2017 was a great year full of its share of challenges but overall we had a lot of fun and tried some new things. I’m already expecting 2018 to top last year and I hope to share some experiences with all of you on the blog. Author Andrew EverhartPosted on January 7, 2018 February 26, 2018 Categories Blogging, Entertainment, Food, Observations, ReviewTags Bicycling, WineLeave a comment on Happy New Year & 2018 Blogging Challenge!